Just as the streets were crowded with crazy contraptions as man made the transition from the horse drawn carriage to the automobile, the same seems to be happening with the glacially slow transition to electric vehicles. 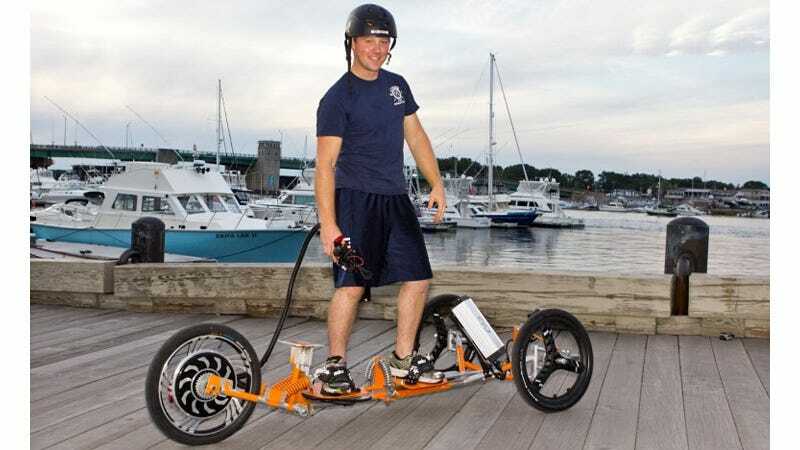 The Segway set the pace, and this Tribey electric trike follows suit as another eco-friendly way to break your neck. At its core the Tribey is basically a recumbent trike outfitted with an electric drivetrain, but in its default configuration it's designed to be ridden while standing—like a skateboard or a surfboard. An optional kit can convert the Tribey into a more traditional recumbent trike that can be ridden while sitting, but where's the fun in that? On a single charge it has a range of about 18 miles, but that number is presumably reduced depending on if the Tribey is ridden at its max speed of 25 mph, and how heavy the rider is. The current version, the Tribey M7, can be custom ordered for $2,500. But only to customers aged 16 years and older. And even then, every single buyer has to sign a surprisingly blank liability waiver (.doc) so when you do break a limb, you can't hold the company legally responsible. That's reassuring, right?